No other raw material needed except Air. High /Low /Normal Pressure Alarm & Ondicator. Rapid Pressure SwingAbsorption (RPSA) Process- NASA derived technology. High Quality Medical Grade Molccular Sieves. ABS injection moulded cabinet which is high in strength and durability. Flow Control Knob allows you the ability to protect your patient from the harmful effects of exceeding prescribed oxygen level. 0.04-0.07 MPa (upto 10 PSI) oxygen output pressure allows the patient the freed longer tubing without restricted the flow. Quiet Unit-allowing restful sleep to patients. Built in atomizer device for atomizing therapy (Nebulization Therapy). Filter: Gross Particle Cabinet Filter Compressor Intake Filter bacterial Filter. 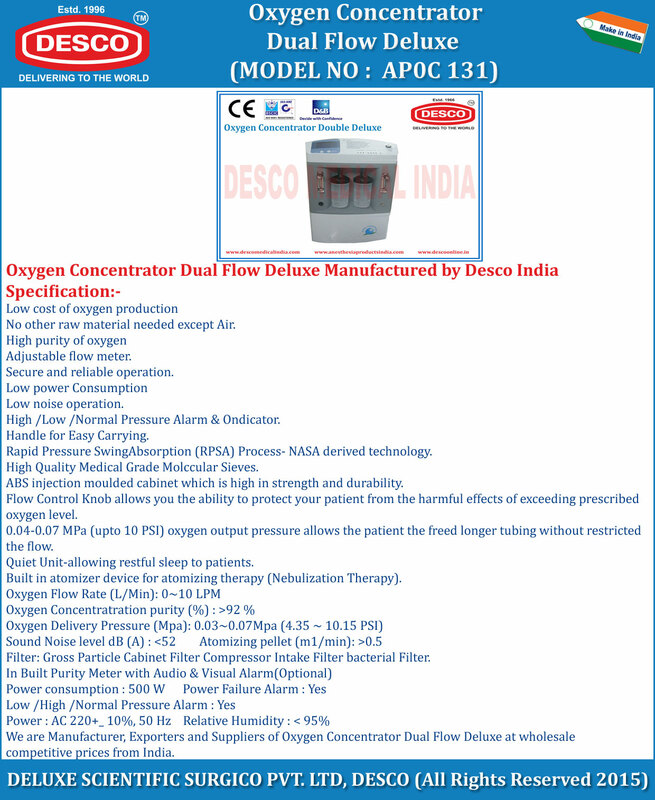 We are Manufacturer, Exporters and Suppliers of Oxygen Concentrator Dual Flow Deluxe at wholesale competitive prices from India.